The Empire Awards, is an annual British awards ceremony honoring cinematic achievements in the local and global film industry. Winners are awarded the Empire Award statuette. The awards, first presented in 1996, are presented by the British film magazine Empire with the winners voted by the readers of the magazine. The 21st Empire Awards, the most recent ceremony, honoring films in 2015, was held on March 20, 2016 in London, England. The awards are sponsored by Jameson Irish Whiskey since the 14th Empire Awards and since then are officially called the Jameson Empire Awards. Best British Film: 1996 to present; In 2002 it was known as "Sky Movies Best British Film"
Best Sci-Fi/Fantasy: 2006 to present; In 2009 it was known as "Best Sci-Fi/Superhero"
Best Newcomer: 1996 to 2011; From 1996 to 2002 it was known as "Best Debut"
Scene of the Year: 2003 to 2007; From 2003 to 2006 it was known as "Sony Ericsson Scene of the Year"; In 2007 it was known as "Scene of the Year"
Best Soundtrack: 2008 to 2009; In 2008 it was known as "Sony Ericsson Soundtrack Award"; In 2009 it was known as "Best Soundtrack"
↑ "James Nesbitt to host the Jameson Empire Awards 2015" (PDF) (Press release). Bauer Consumer Media. Premier. March 25, 2014. Retrieved October 2, 2014. ↑ Ojomu, Nola; Leyfield, James (March 30, 2014). "Tom Cruise cuts a dapper figure in an immaculate navy suit as he is named Legend Of Our Lifetime at the 2014 Empire Film awards". Mail Online. Associated Newspapers Ltd. Retrieved April 1, 2014. ↑ "Jameson Empire Awards 2009 - Nominations" (Press release). Bauer Consumer Media. March 2, 2009. Archived from the original on May 8, 2009. ↑ Turney, Ewan (December 1, 2008). 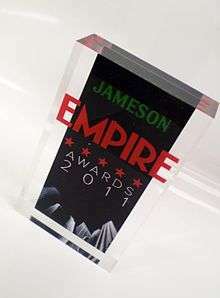 "Jameson to sponsor Empire Awards". Morningadvertiser.co.uk. William Reed Business Media. Retrieved October 1, 2014.